Well, you can impact over 700 people’s lives. You can help 700 people live sustainably and for free! 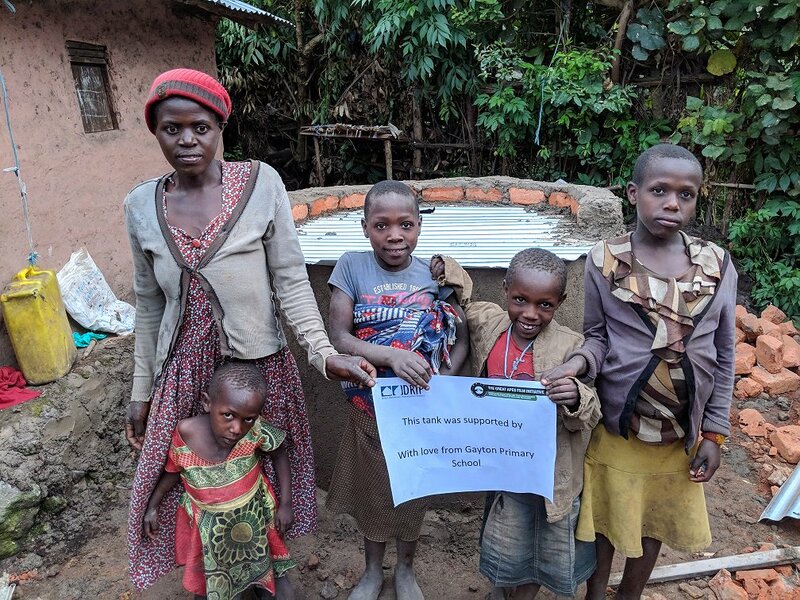 You can; teach them, train them and build rain water-harvesting tanks with them. You can support them to save money to pay for:school, medicine and of course cows, chickens and goats for wedding presents! 8 incredible people journeyed over 9800km to Pallisa in eastern Uganda. 24 hours of neck creaking travelling, some dry shampoo, anti-bac, chewing gum and the group clinging desperately onto aloevera toilet roll – we landed. Had the best lightening and thunderstorm shows most evenings. Worked in 30 degree heat. Built 70 rain water harvesting tanks. Taught 70 families on how to: water their plants, save seeds, make natural fertilisers and pesticides. Washed in big bowls of water – never really getting clean. Lived with the philosophy of, “if it’s yellow, let it mellow… if it’s brown…” find a bucket and some smellier water to wash it down. Were called Muzungu – white person – on an hourly basis. Educated the children of Uganda – they now know that if they rub our skin hard enough, it goes red, not black. Learnt more words in: Swahili, Lugandan and Ateso. Found out that Ugandan salt is a lot saltier than Spanish salt. Understood how celebrities feel when children throw rocks at them. Were given a live chicken as a thank you for our work (flowers are over rated). Realised that the Paraffin bottle needs to be more clearly labelled. Could identify team members by the noise and smell of their gaseous exchanges. Lived without technology including: emails; text messages; Facebook and regular communication with loved ones. Had our first shower under a 40m waterfall. Bought a round of 8 beers for under £5. Realised that it really is the small and simple things that make us part of the most exciting adventures in life. Learnt humility, love, teamwork and the power of friendship. I write this blog, partly in my journal on the trip, capturing moments, smells,conversations, “vistas” and tastes… But also on the way home – on the plane, at the airport and now, on my sofa, listening to Florence and the Machine. Got around to having my eyes checked, teeth cleaned, nails done and hair chopped. And then I think about what I actually did do. And what amazing capacity a team of inspired and motivated individuals can achieve in such a short space of time. These 2weeks have made me even more determined to get out there and be of service to human kind. Whether this service is in my role as Director of ParticipationPeople or volunteering my time for other causes that are close to my heart. Life is about getting out there, taking action and empowering others to find and follow their own passions. The story to leave you with is the team’s African naming ceremony. I was re-christened as Apudun in Ateso. This means grounded or down to earth individual (not short @TomDixey). It was a bit like the sorting hat in HarryPotter – however, my new name resonates with my soul, not Slytherin. Onto the next adventure! South America is calling my heart, soul and feet!